Paying for online college education can put financial burden on families. For many people, the cost of education is one of the reasons why they put off getting their education. This is especially challenging for adult learners who have family responsibilities and in many cases, mortgages and other consumer bills to deal with. Interestingly, this is a vicious cycle. While the cost may stop you from getting your education, failing to get that education can hold you back from getting the promotion and increased income you want and deserve. And of course, going back to school itself could mean cutting back your work hours, which means earning even less. So thinking strategically about how to pay for your online education is a crucial piece of your education planning puzzle. Luckily, there are many ways you can pay for your education. Since every person’s situation is different, it is important you carefully evaluate your options. Ask all the necessary questions, and gather all the data and information. Do not be intimidated by the problem; just confront it, and you will find answers. In many cases, you may want to start with the financial aid office in your proposed institution. A financial adviser should be able to guide you. 1. Employer Assistance: Many companies offer educational assistance programs as part of their employee benefit plans. Good companies recognize that a well-trained workforce enhances productivity and retention of good workers. Smart employees take advantage of those opportunities. Most educational benefits come in the form of tuition assistance, which will cover some or all of your online college tuition, books and supplies. Ask your HR manager about the terms and details. Most companies prefer employee tuition reimbursement plan, while some have direct billing arrangements with colleges and universities. Either way, many online students receive all or part of their online college tuition from their employers. You just have to ask. Sometimes, you may not know such opportunities are available until you ask! According to a stunning statistics released a few years ago by the International Foundation of Employee Benefit Plans, while 94% of surveyed organizations in the United States and Canada offer education assistance plans, only 15% of the employees actually use those assistance. What a waste! 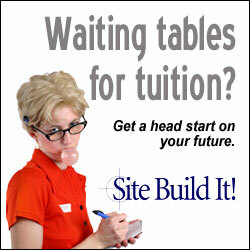 Use your educational benefit plans to get your education. You owe it to yourself and your future. If your company does not have education assistance plan, politely suggest to your boss to start one … or consider transferring your services to another organization that offers such benefit. 2. Scholarships and Grants: These are great forms of financial aid that can help pay for some or even all of your online education cost. Scholarships and grants come in several forms. Some are for in-coming students, and others are for currently enrolled students. Some are for academic merit, financial need, athletic or other activities, or for some type of affiliations like fraternity or sorority. Some are for diversity, including even international students. Some scholarships and grants are offered by the university, federal or state governments, churches, social organizations, alumni, foundations or individuals. As in all things college funding, the key is to search! Ask questions. Stay focused. Do not make assumptions. 3. Military Plan: The military provide tuition assistance to members of the United States armed forces and their families. Whether you are a serving active duty, a member of the Reserve or National Guard, or a spouse of a military member, there are several educational assistance available to you. Through the Montgomery GI Bill or the Post-9/11 GI Bill, a veteran or military service member (including National guard and Reserve) could receive up to 100% paid tuition and fee benefit of an equivalent of the highest in-state undergraduate tuition of a public institution. Under the Military Spouse Career Advancement Accounts (MyCAA) program, a military spouse can receive up to $6,000 in financial assistance for degree or continuing education programs as well as licensing and credentialing fees. MyCAA is a Defense Department program designed to help military spouses pursue portable careers in high-demand, high-growth fields such as health care and education. 4. Federal Student Loan Programs: If you cannot fund your education through employer assistance, scholarship and military aid, you may need to take out student loan. Your first stop should be the federal loan programs. Each year, the US Department of Education makes or guarantees over $70b in low-cost student loans. These include the PLUS Loans (“Parent Loans for Undergraduate Students”) Subsidized Stafford Loans (need-based), Unsubsidized Stafford Loan (non-need based), and Perkins Loans (low-interest loans for “exceptionally” needy students). Work closely with your schools financial aid office, complete the FAFSA applications and they will help you put together plans to fund your education. 5. Private Loans: In addition to federal loans, there are also many private student loan products that are available to online education students. These are mostly provided by banks, credit unions, non-profit organizations, and other financial institutions. Many of the loans are based on credit worthiness, and they charge various fees and interest rates depending on your credit history and the lenders’ criteria. Do not go to private loans until you have exhausted all your other funding options. And remember: take only what you need to pay for your education! Again, work closely with your school’s financial aid office, but make sure you READ AND UNDERSTAND ALL the fine prints (where in doubt, ask questions), especially the interest rate, application fees, repayment period, grace periods, the total cost of the loan, etc. 6. Cash Plan: Yes, you may need to ‘self-fund’ some or all of your online education. Think it through carefully and clearly. Evaluate the pros and cons. Talk to your financial adviser and family members. Options can range from personal and family savings, credit cards, home equity loans, to gifts and loans from family and friends. The key is to explore all options, and determine what’s best for you. In addition, many schools have tuition payment plans, a sort of “pay as you go” plan, in which you can pay for one course at a time, or spread out your semester or annual tuition over several months helping you manage your cash flow and budget. Some tuition management companies include the TuitionPay (by Sallie Mae), FACTS Management Company, and the Tuition Management System. 7. Loan Forgiveness: Because of shortage in certain fields or geographic regions, some or all of your educational loans may be forgiven in exchange for your services. Some key areas are healthcare, teaching and law enforcement in underserved geographic regions. Additionally, volunteer services like AmeriCorps and Peace Corps offer educational loan forgiveness or deferments. As you can see from this article, cost should not stop you from getting your education, especially in the United States of America. Paying for online college education is doable. There are several options available to you. All you need is a determination that you want to get your education, and you’ll find a way to pay for it.